While trees are a beautiful asset to a home anywhere in the country, in Phoenix, trees are often the single most important part of your residential landscaping. The number of years it takes for a tree to fully mature makes it a valuable commodity for a home. It may cost little to plant and grow a tree, but it can't be installed or replaced in a few weeks like a kitchen or bathroom remodel. This is why, for homeowners in Phoenix, tree service is a must whenever a problem is identified. However, Phoenix tree service companies are not only beneficial after a problem is established! To keep your landscape as attractive as possible and make sure your trees pose no threat to your property or other trees and plants in the area, homeowners should view tree service as a preventative measure, as well. Phoenix, and the state of Arizona in general, have some of the more strict plant and tree removal laws and ordinances in the United States for good reason. Although the Grand Canyon may dominate pamphlets and brochures, Arizona's unique and visually stunning plant life is a state treasure that the government rightfully wants to protect. This doesn't mean you can never remove a tree from your property. You will, however, need to get permit in most cases. 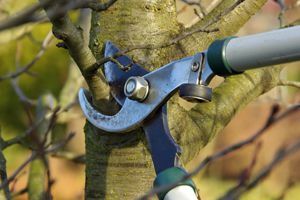 In Phoenix, tree service companies are able to remove any tree that poses a threat to your property, but they may also be able to eliminate that threat without cutting down the tree. The latter, of course, is generally the cheaper and more effective way to go. Believe it or not, the Arizona flora that resides in your yard holds a lot of value; some Phoenix homeowners have successfully sold certain species of palm trees (usually to Southern California homeowners) at quite a profit, though the red tape can be substantial. Whether to improve appearances or increase the value of your property, it is worth the effort it takes to keep your trees healthy. Cutting down a tree that is beyond treatment should only be done as a last resort, but when it is necessary, it should be done by a qualified Phoenix tree service company to make sure the felling and disposal of the tree are done safely. Unless your tree is getting too big, seeds are causing havoc for your lawn care, or you purchased a home with a tree you can't stand, Phoenix tree service is more likely to involve trimming and maintaining trees rather than removing them. Regular trimming keeps trees from posing property damage, but it also promotes new growth and provides protection from certain insects and diseases. Between convenience and safety, the benefits of professional Phoenix tree service are obvious. However, since tree service companies are not likely to work for free, bundling tree services with other, similar tasks is the most cost-effective way to go. Lawn care companies often offer service packages that include tree trimming. In some cases, you may be able to find a single company that will be able to handle all of your small, outdoor needs like tree trimming, watering, fertilizing, lawn mowing, and maybe even gutter cleaning for a single, monthly bill. Though ice storms and heavy snows (a prime factor in tree damage in other areas of the country) are generally not a cause for concern in or around Phoenix, tree service companies are still available for emergencies due to lightning strikes, high winds, and rapid insect or fungal infestation. In these cases, the removal of heavy branches or whole trees must be done quickly to prevent any damage that could be caused if the tree or branch falls. Unfortunately, emergency services of any kind (from 24 hour locksmiths to emergency plumbing) are typically higher than the cost of making an appointment a week in advance. While emergency tree services in Phoenix are probably not called for as often as they are in other areas of the country, the best course of action is always getting your trees trimmed and cared for regularly, as this can often prevent the need for emergency services down the road. We see Phoenix tree service costs range all over from $100 to $1,000, although the difference in cost is usually in the details of the job. First, the cost of annual lawn care can range up to $1,000 or more, but are broken down to a manageable monthly cost of $100 to $200, depending on the company you hire and the level of services. The cost of tree removal, by contrast, is usually dependent on the size, type, and location of the tree. Be sure to discuss grinding down the tree stump and hauling the tree away, as these services can affect the price and be the source of discrepancies between two estimates. Generally speaking, costs have been on the rise, as nobody has escaped the crunch of gas prices. Finding the right Phoenix tree service contractor is an important process for protecting your trees (and your house and property during tree removal) without paying more than you have to. Much like taking on an ill-fated tree service project yourself, an unreliable contractor may not observe correct safety standards or proper care practices. HomeAdvisor prescreens all our contractors and provides homeowners with quality-controlled online customer ratings and reviews, a much surer bet than simply opening the phonebook and making random calls. Plus, you can make sure you get the best from the contractor you choose to hire by providing cool beverages or even some ice cream to the professionals who are working on your home. Comment: palm tree, within 3 feet of pool, in back corner of section, needs removing. Unable to bring heavy equipment into the yard. contractor need to be licensed, bonded and insured. Comment: I would like to get an estimate for tree and maybe removal trimming. Comment: I would like to get an estimate for tree removal, leave stump unless it fits her budget. She mainly needs 40ft trees removed and hauled away. please call her asap, she. Comment: I would like to get an estimate for tree removal of 2 palm trees. Comment: Need to remove a large tall mesquite tree from my backyard. Phoenix Tree Services are rated 4.75 out of 5 based on 3,181 reviews of 90 pros. Not Looking for Tree Service Contractors in Phoenix, AZ?